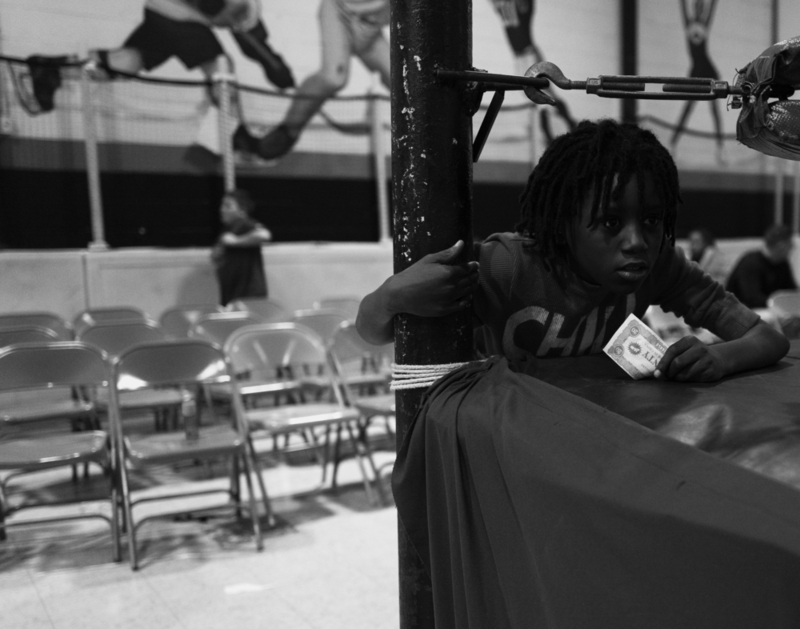 On a Saturday night in search of somewhere to go with her six-year-old son, photographer Annie Morton found herself engrossed in the world of the local amateur wrestling scene. Though it may have seemed quite brutal on the surface, she found it to be more about a sense of community than anything else. Debra: So how did you end up at amateur wrestling in the first place? Annie: Well, it’s something to do when you have a six-year-old boy on a Saturday night. That was my introduction to wrestling. We are in Bucks County, Pennsylvania, so there is a limited number of things you can do, and a friend of mine introduced me to it. The first event was at a little VFW hall—an organization called Excellence Wrestling. It’s mainly dads with their kids, but there are some moms there too. There’s an open bar, and everyone’s having a good time watching the match. It’s really awesome; it’s made for families to go out and enjoy it. It was really interesting. Debra: And, as always, you had your camera? Annie: It was just amazing! The crowd, the wrestlers—there were even some wrestlers just fighting in the seat next to me. Then, after the match, they have a meet-and-greet where you can get their autographs. I couldn’t help it. I had to keep going! Debra: I look at these images, and these characters are just incredible. In a way, they look so brutal. Annie: I also went to Philadelphia to shoot, and there, the crowd was completely different, which was different again from the crowd in Gilbertsville, PA, and then again at the VFW here in Pipersville. So you get to see these very different slices of life in Pennsylvania. Debra: Could you tell us about some of them? Annie: The two women I photographed sitting together—their hair was amazing. They had bright colored bangs! Debra: Were they happy to be photographed? Annie: Everyone was so nice! I would ask, and they would say, “Yeah, sure go ahead.” It was really, really cool. Debra: You seemed to have been enamored with some of the rituals you witnessed. Annie: When I talked to some of the wrestlers—the way they travel and tour—they follow a circuit and can be invited to perform at certain events. It’s just like the indie rock scene. They will go anywhere they can drive to, even as far as Florida. There are different organizations, like Excellence, which is where I took most of these photos. Some of the others are from the World Wide Wrestling Alliance, but they travel, their girlfriends go with them, their fans follow them from match to match. I saw some of the same fans at different events. Debra: And we know they are completely performing? More than they are athletes? Annie: That’s the interesting part. They are incredibly athletic. The stuff that they do—it’s insane! The flipping and the diving—they have to be pretty athletic. And they do get really hurt. One night, the wrestler dove out of the ring and landed right on the floor next to me, and you could hear the sound of the impact, if you know what I mean. It was bad! It had to hurt. There was no way it didn’t hurt. Debra: There is another image where the guy is grabbing his side. He looks hurt! Annie: Now that is an example of the “performance art” that happens. He actually wasn’t hurt! That is part of the acting. A lot of them are also actors and actresses. They bring that to the whole wrestling thing. Debra: I was surprised when you said it was a family focused event. What really enamored you the most about the whole spectacle? Annie: I also didn’t expect that it would be geared toward families and kids, and that they would all be so incredibly nice. And how much they engage with the fans. The Excellence Group also raises money for the Polaris Project, which fights human trafficking. Debra: So it sounds like its a totally positive vibe all around. Annie: It’s incredible. And then, of course, you also have the wrestlers that are hoping that one day, they will move past the indie scene and move on to the professional WWE. But for the most part, it’s family oriented. It’s fun! Everybody was really helpful; it was a great experience. I’m actually quite sad that its over, but I’m sure I’ll find a reason to go back. Debra: Let’s talk about the woman in the mirror. Annie: Oh, that’s Destiny! She is amazing. She lives in New Jersey and works for an accountant during the day. She has been doing this since the ’90’s. Debra: What were the big differences between the men and ladies? The ladies in wrestling are fierce. Annie: Well, Destiny plays the role of “manager” to Stan, so for them there is a lot of acting, but she has to be very fit to do what she does. There is a whole scene where she comes out into the ring and kisses the referee, and then the ref gets distracted, and then Stan jumps in and does something crazy. Debra: So they have a whole schtick? Annie: Yes, she is a character in the story and plays it as if she’s not a wrestler, but then winds up wrestling, because eventually another wrestler attacks her! Debra: Oh, so then she gets “accidentally” dragged into it and that’s part of the story? Annie: That’s my interpretation of it, yes. She plays Stan’s naughty manager. It’s similar to my old modeling life, when you get asked to certain events and asked not to do other ones. So I think Destiny is quite pleased to still be booked and involved and working for as long as she has been working. Debra: Let’s get back to the fans. It seems like that’s also so much like an indie rock show. If you don’t have an audience to vibe off of, you’re not going to have great show. It’s a dance between the two. Annie: Yes, absolutely. Between that, the touring, the fact that everyone wants to break out, the fan groupies that follow them, the girlfriends in tow—the two worlds do have a lot of similarities. But I just love people and faces. They are just incredible rooms full of faces. Debra: So from a photography standpoint, do you prefer to interact with the people or be a fly on the wall? Annie: I do both, depending on the situation. I might try not to let anyone notice me, but in situations when I start to feel comfortable, I will try to interact with people, try to know them and understand them and ask them if I can photograph them. Debra: What difference do you see in pictures between the two? Annie: I definitely prefer the fly on the wall experience because people are more genuine. So you just have to wait for them to forget that you are there. Debra: Are you composing and thinking about them? Annie: Sometimes yes, but for the most part I’m just trying to let the scene unfold and see what happens and work with it as opposed to trying to make something happen. Debra: I’m looking at the people in these images and there is simultaneously something so tragic yet something so beautiful about them. What’s with these people? Annie: It’s where I’m from. This is who I am. I grew up right outside of Philadelphia. For the good and the bad, these are my people. So I’m like, right on! Let me take your photo! Debra: You can see the love that you have for these people in the pictures. That’s what the Culture Crush is all about. You are practicing documentary photography, examining what people are about, looking at how they are putting themselves together and how they decide to go out into the world. Having makeup done backstage at fashion show doesn’t have more value than Destiny getting ready in the bathroom. These moments have more value. They can be spectacular. Annie: Having that direct connection to this part of the country and to the people that are here—it’s what I know; it’s how I grew up. I do love everything about it. It’s home.